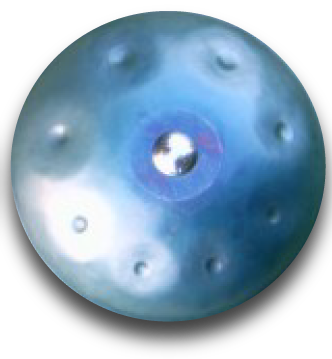 THE INSTRUMENT IS CONSTRUCTED FROM TWO HALF-SHELLS OF DEEP DRAWN, NITRIDED STEEL SHEET GLUED TOGETHER AT THE RIM LEAVING THE INSIDE HOLLOW AND CREATING A DISTINCT 'UFO SHAPE'. 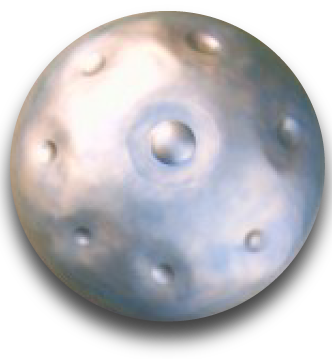 THE TOP ("DING") SIDE HAS A CENTRE 'NOTE' HAMMERED INTO IT AND SEVEN OR EIGHT 'TONE FIELDS' HAMMERED AROUND THE CENTRE. 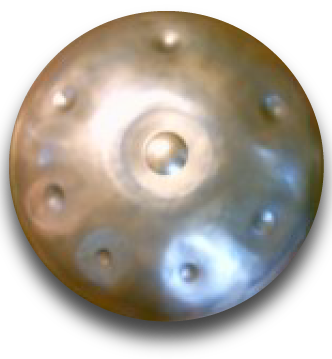 THE BOTTOM ("GU") IS A PLAIN SURFACE THAT HAS A ROLLED HOLE IN THE CENTRE WITH A TUNED NOTE THAT CAN BE CREATED WHEN THE RIM IS STRUCK. THE HANG WAS DEVELOPED IN THE YEAR 2000 AND INTRODUCED AT THE MUSIKMESSE FRANKFURT IN 2001. IT IS 52 CM IN DIAMETER AND HAS A HEIGHT OF 24 CM. 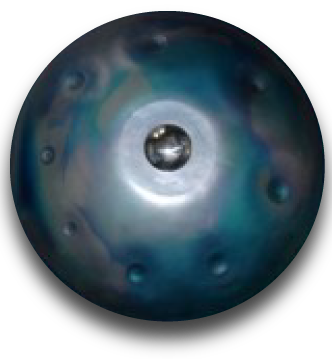 THE TWO DEEP DRAWN STEEL HEMISPHERES OF THE HANG ARE HARDENED BY A PROCESS KNOWN AS GAS-NITRIDING. THE SIDE CONSIDERED THE 'BOTTOM' HAS AN OPENING (GU) IN THE CENTER WHICH ALLOWS THE GENERATION OF THE BASS NOTE THROUGH HELMHOLTZ RESONANCE. 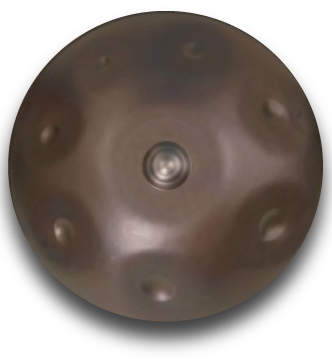 PANART NO LONGER PRODUCE THE HANG AND HAVE MOVED ON TO DEVELOP A NEW INSTRUMENT CALLED THE "GUBAL"
GROWTH OF A WORLDWIDE INTEREST IN THIS INSTRUMENT CREATED A GROUP OF SIMILAR INSTRUMENTS WHICH ARE commonly REFERRED TO AS "HANDPANS"